A few of the teachers at school went as dominoes this year, and I think this is my new favorite costume! That’s my in the middle between our new speech teacher and our new art teacher. Music and a new 1st grade teacher also went as dominoes, I just loved this. 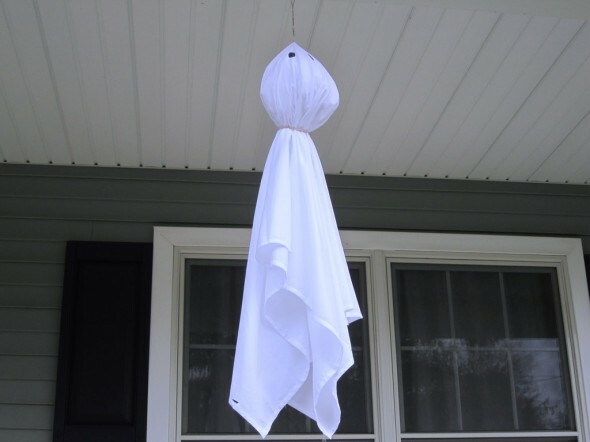 I made a Morley ghost for the front porch this weekend. When I was a kid we always made a Morley and hung him from the tree next to our apartment. I have no idea why he’s called Morley, I think it was an idea my mom found in a magazine and they named him Morley. But regardless, he’s been a part of my family in one way or another since I was knee high to a grasshopper. And he joined the pumpkins and the new scarecrow I got. 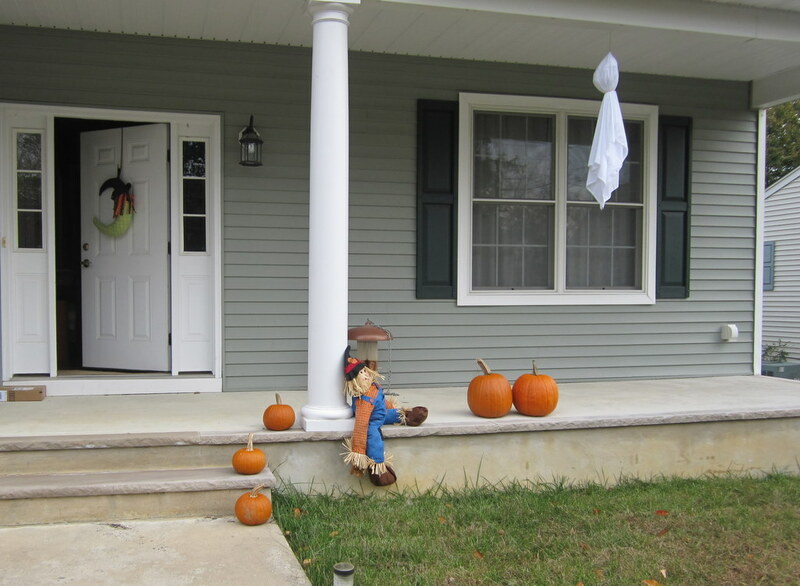 I bought that scarecrow on Amazon, and he’s stuffed with all of my old fabric scraps. I did not, unfortunately, carve pumpkins this year. That’s a first, but I just couldn’t bring myself to deal heavy gourds and guts. “Morley” is a character from Dickens’ “A Christmas Carol.” I always had Christmas on my mind at Halloween because if you wanted to get most of your toys mail-ordered from Sears, the order had to be placed by Oct. 31st. Good morning! I love your domino costumes. Can you tell me what you used for the dots to stick to your clothes? It doesn’t look like paper, so any ideas would be appreciated. 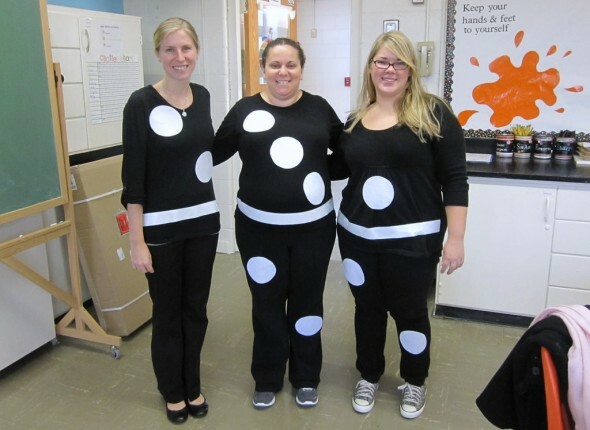 We are going to be dominoes this Saturday, but I can’t figure out what would work best for the dots and line to stick down on our clothes. Thank you so much! Hi. Could any one suggest how and what to use fior domino dots. As I need to make those costumes for my friend.